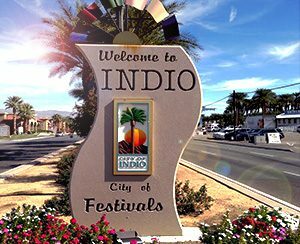 The City of Indio is a resort town located in Riverside County, California, and is know as the “City of Festivals”. North and South are divided by the I-10 Freeway. North Indio is know for beautiful gated communities, safe communities, family homes, affordable home prices and the gorgeous views of the Coachella Valley. North Indio also is home to some of the best in entertainment with some of the largest casinos in the Desert featuring weekly top-tier acts just minutes from the subdivisions of North Indio. If you seek some of the best value, safety, security and affordability North Indio can offer all this to home buyers some of the most amenity rich developments anywhere! See the list below to find the perfect home on or off a golf course! Sun City Shadow Hills (SCSH) is the only development in North Indio to offer single-family homes on a golf course. Built by Del Webb / Pulte Homes, the amenities, activities, and quality of the homes are second to none. This beautiful development is restricted to 55+ occupants, but does allow investors under 55 to own rental properties. With an Executive par-3 course and a Championship course there are many options for homes on the course. Due to some of the lowest HOAs for any golf community, proximity to nearby shopping, fast and easy access via the I-10 Freeway to the rest of the Coachella Valley and the quality homes at affordable prices makes SCSH one of best options for a 55+ community in the Desert! The Four Seasons Terra Lago is a 55+ age restricted community that is connected to the Golf Club at Terra Lago. While no homes are built right on this golf course, the Four Seasons offers great homes with amazing views, discounted golf rates for residents, tennis, pools, practice putting greens, a beautiful residents lodge and tons of other activities and amenities. This family-friendly gated-community features great parks, close proximity to Shadow Hills School, and some of the best views in the Desert. This unique development is the only place in the Coachella Valley offering a waterski lake right in your backyard! Shadow Lake Estates offers 2 waterski slalom courses, your own personal dock, with a boat lift, and some of the most fabulous homes in the desert! If you enjoy paddle boarding, fishing, wake-boarding or waterskiing in a luxurious environment this one of kind development is perfect for you! HOA fees depend on location and lot type and range from $150 – $811 (+/-) a month. Terra Lago is one of the most interesting subdivisions in North Indio. This development features a 20 acre lake, amazing clubhouse, sprawling parks and is connected to the beautiful Golf Club at Terra Lago. For families and retirees alike, this development is a must-see, one-of-a-kind community in the Desert.